OMAHA, Neb. (KMTV) — In a parking lot outside Baxter Arena, the UNO Men's Soccer Team is spending their spring break filling a truck with goods for the Salvation Army. "It didn't really affect us but we understand the pain people are going through so we just wanted to help. Anything helps, so we're just out here to help people out." 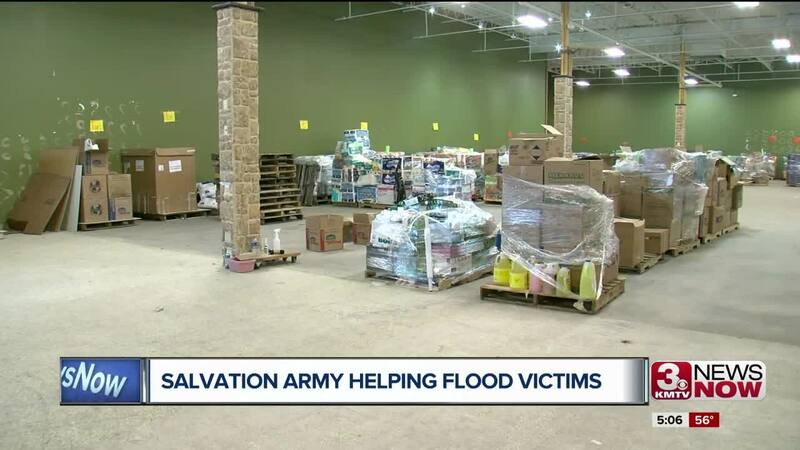 "We'll load you up well," says Salvation Army Volunteer Cindy Popp. A one-stop shop to repair a flooded home. Popp began volunteering just two days ago. "It's Devestating, it's heartbreaking and I'm so proud of Omaha. I'm glad that I can help them, they're very appreciative but they help me more than I help them." We tagged along as she helped out one flood victim, Cary, who is battling more than a flooded home. "She's struggling, she's had a lot of medical issues. It breaks your heart," Popp says. With a full cart, Popp sent Cary on her way, but not without a goodbye and a hug.